Softvelum team continues analyzing the state of streaming protocols. It's based on stats from WMSPanel reporting service which handles data from Wowza Streaming Engine and Nimble Streamer servers - there were 3600+ servers on average this year. A number of views has grown from 20 billion in 2016 to 34 billion in 2017 - our customer base is growing, more and more large customers are coming from various verticals, so all major the protocols are well represented. Here's what what we can see from this year. HLS keeps the throne with 60% of the share - it's a de-facto standard for end-user media consumption. Apple keeps improving it with fMP4 and HEVC support so it's not going way any time soon. 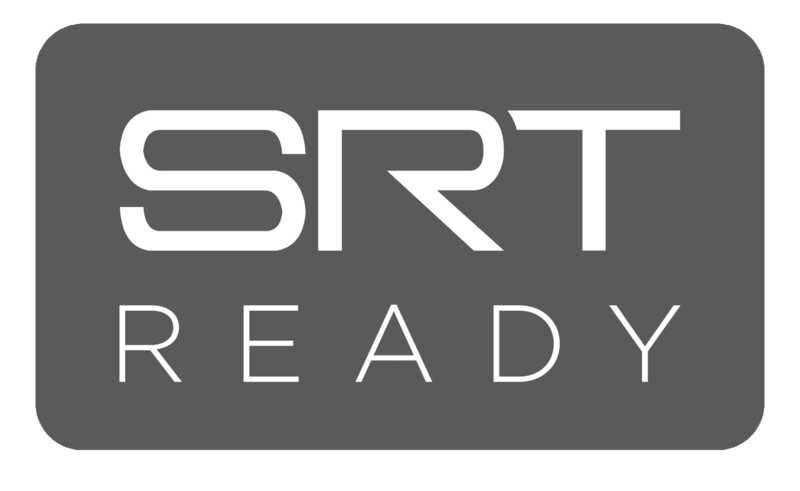 RTMP is still in use for live streaming scenarios, especially when is comes to real-time delivery. Regardless of continuous Flash decline, this protocol will remain active for some time. 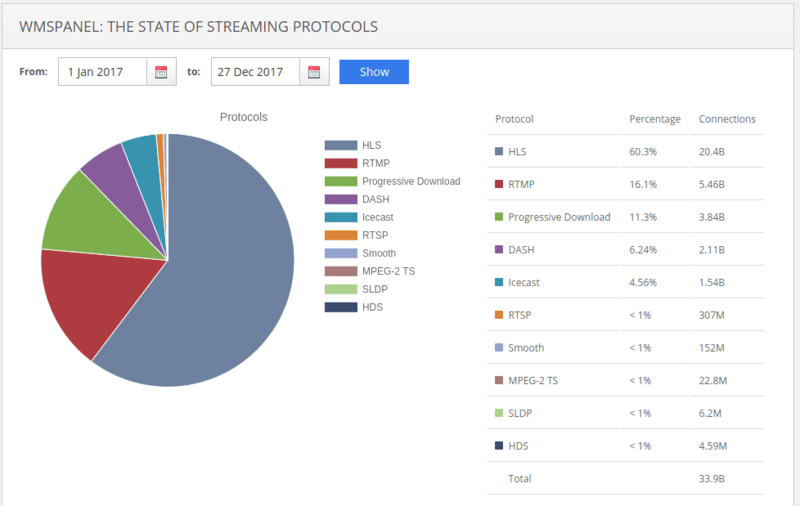 SLDP is a new protocol created by Softvelum for those who cannot use Flash and RTMP but still need to deliver real-time streaming. It's based on WebSockets and it can deliver content to MSE-enabled browsers on most platforms. Also, native mobile apps and SDKs can be used for adding SLDP playback on Android and iOS. It was introduced back in late May but it's already got a few millions of views in our customers' networks. MPEG-DASH got a great launch from nearly zero to 6% and it's still gaining momentum. Being DASH Industry Forum member, Softvelum keeps contributing to the community and supports the wider adoption of this technology. 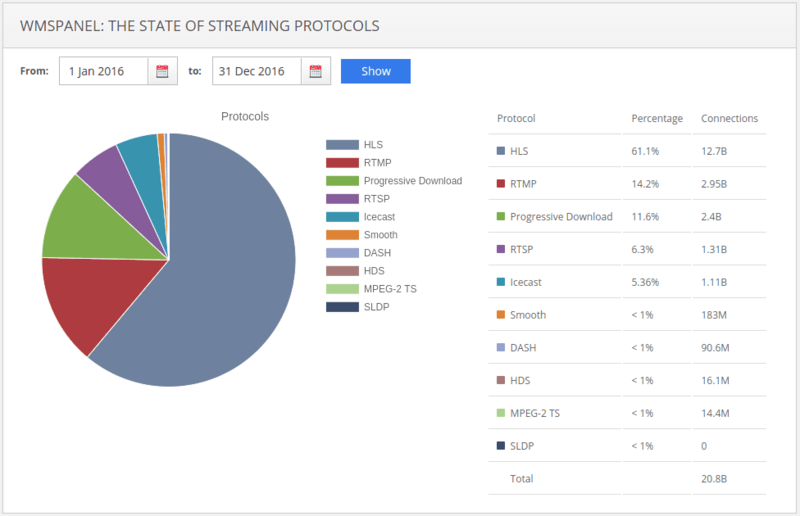 Progressive download is traditionally strong in VOD scenarios and many of our customers use it for media delivery along with HLS. 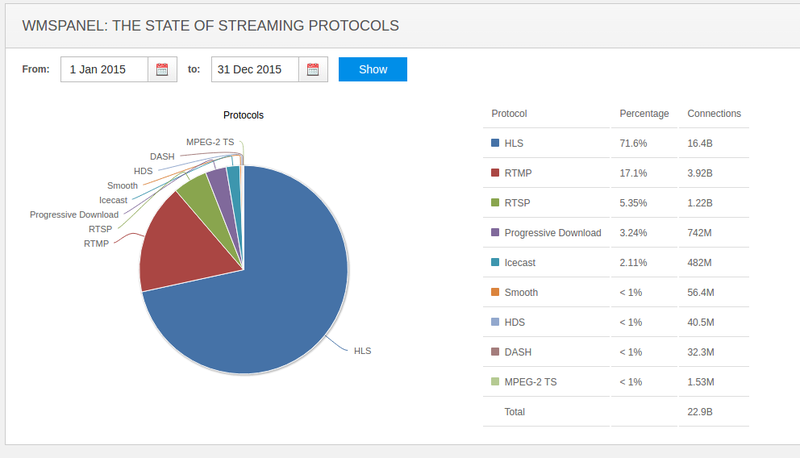 Other protocols are becoming more niche, getting less percentage over time as you can see. Check our stats from 2015 when we collected the data from 2300+ servers.